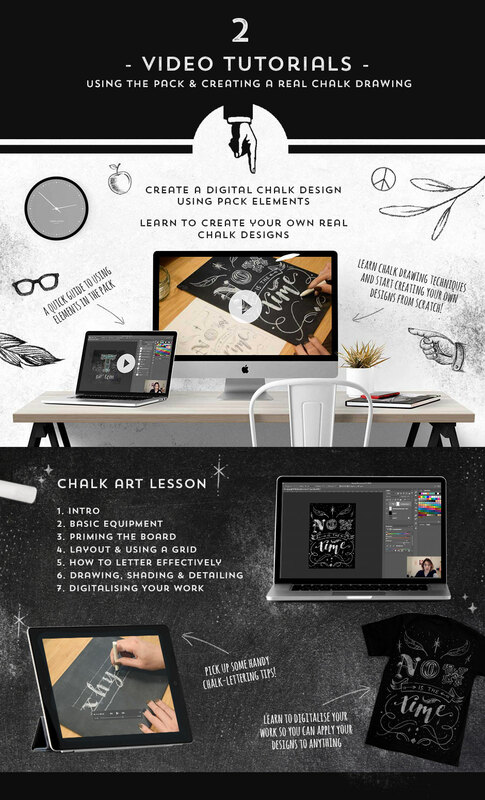 Introducing The Chalk Extravaganza Pack, the most authentic and comprehensive digital chalk pack in the world! Perfect for wedding invites, birthday cards, branding, menu designs, Etsy creations and so much more! The perfect way to give your work a charming, hand-drawn feel. 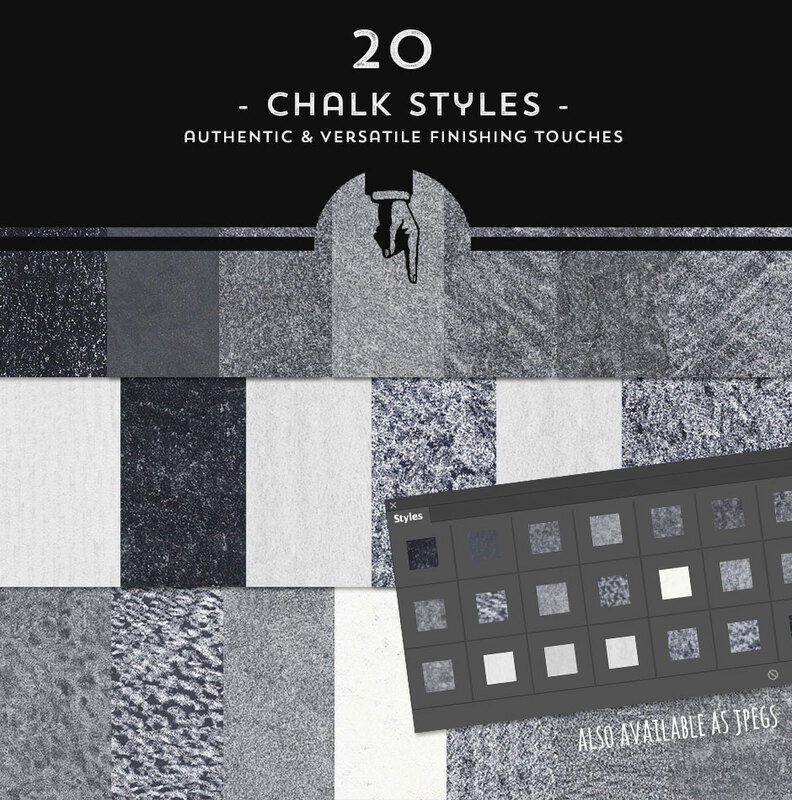 We’ve teamed up with professional chalk artist Jo Fallon, to bring you a truly authentic digital chalk pack. 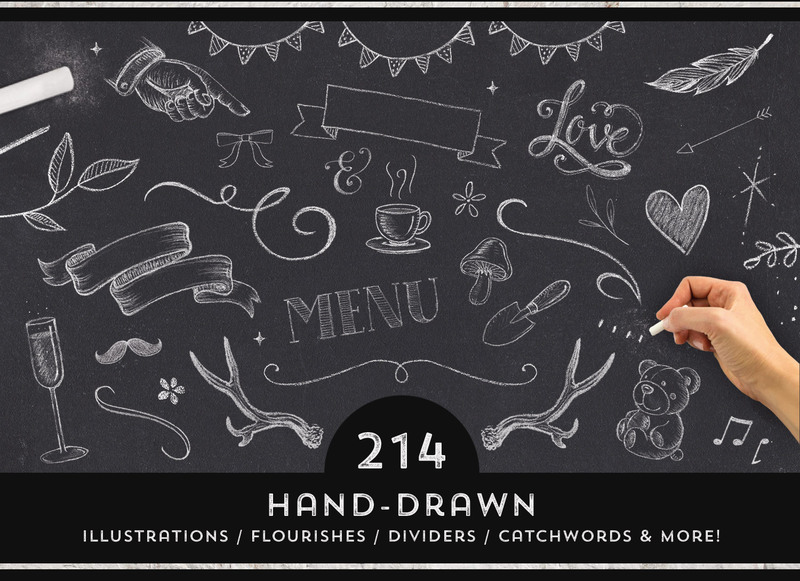 Most digital chalk packs are cheap imitations of real chalkboard art, whereas Jo has spent months capturing every rough edge, natural line and speck of dust from her regular work. So much chalk was scanned that Jo had to purchase a new scanner at the end of this project, as so much chalk dust had gotten into it! All flourishes, catchwords, dividers, illustrations and stamp brushes come in both transparent .PNG and vector format in both black and white. Having had a few days now to play around with this amazing pack, I just want to say I’m loving it! I could obviously see it’s potential for “paper” products, etc. but wasn’t sure at first if it would lend itself to T-Shirt designs, which is what I do mostly. However, it’s given me loads of ideas. Thanks Jo, it’s a great product & well done. PLEASE HELP! I *love* this and have a project list a zillion miles long that I can’t wait to get started on … however, I’ve tried to download the first part twice. Both times it won’t decompress. It says that the path is too long? Any insight at all? Thank you! Thank you so much for taking the time to leave us a comment Lisa and we’re so happy to hear that this pack is perfect for so many of your next design projects! This truly is an extravaganza – an incredible pack with thousands of possibilities! Fabulous Jo – well worth the standard price, but thanks for the 50% discount DC – early Christmas present, excited to ‘unwrap’ all the downloads!!! I love this so much. I’ve already set up a “chalk” library in CC with the backgrounds, images, and styles I will use with this. The feel of this set is warm, local, hand-done, and nostalgic. I absolutely love it. Wow, that’s fast work Doug, but so great to hear and we hope it makes an excellent addition to your collection! I admit, I was not sure whether to buy this pack or not as I had no idea what to do with it. The longer I looked at the listed pictures and joining the live presentation it made it impossible to resist longer. Not only that the ideas are circling in my head, no you even get a tutorial on how to use and work with layers, masking layers and how to manipulate them with color, saturation hue. And as Iskander already wrote: it is CHALKALICIOUS. Makes me want to wipe out all the bad made chalkboards in front of the restaurants and re-do them. Thank you for this well made pack. That’s so lovely to hear Andrea and we really appreciate the support, so than you so much for sharing your journey with us and we hope you’ll end up getting loads of use out of this one! Haha, thanks Andrea! So happy to hear it’s getting you inspired! Yeah, you’ll suddenly start noticing chalkboards a lot more… play your cards right, you can sometimes get a free lunch in exchange for some refreshed signage. 😉 If you’re ever stuck for ideas or need help using the pack, just give me a shout! This pack really amazing! Jo has thought of absolutely everything – there are so many elements and the quality/details are fantastic. My head is spinning thinking of all the projects I want to create with this. Thank you! This is a great pack, watching the webinar now and downloading it, can’t wait to try it out. I am currently using PSE 2018 but I am going to give it a try 🙂 Looks as though you have made it very user-friendly no matter your software. Thank you 🙂 Sometimes as a PSE user, we get totally left out. This is definitely CHALKALICIOUS!! I’ve already bought it when it was just out of the oven. A beautiful artistic tool for everyone. This is for sure a 5-Star pack. Congratulations again to Team DC for a great effort getting this together! Wow, super fast purchase this time Iskandar! This is fantastic Jo! I can see all the love and attention to detail you put into this pack! Amazing work!!! I missed this when it was 50% off so of course I had to buy four other products (Including two of yours, because I’m addicted to your work!) to create my own 50% off. I can’t wait to use them all! I was really looking forward to this pack and it’s really exceeded my expectations. Well done to Jo and DC for putting this together, and thanks very much for the discount. Hi Carl, that means a lot to hear, thank you! 🙂 Hope you have fun with it. Not sure where to start first! It all seems so exciting! We’re with you on that one Liz! We hope you’ll love working with all of it though and it makes an excellent addition to your collection! Colorizing PSD files in Elements. Google often shows solutions. That’s how I’ve taught myself so many things. For $9.99/month, you can get both Lightroom AND Photoshop. You get so much bang for your bucks. You can FULLY use all the cool art from DesignCuts for those programs. Lightroom will help you organize, find, resize/crop/watermark and export for online usage. So fast! Batch prepping files is sooo easy. You can easily save one hour a month doing that and make back the cost of the software. 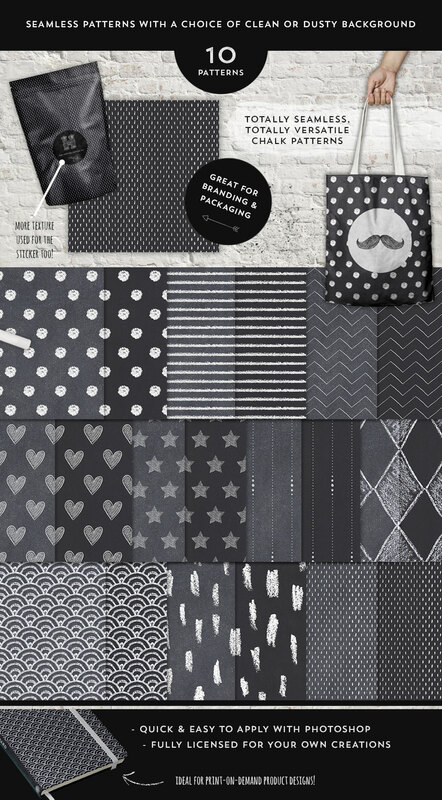 Best of all, you can really go to town with DesignCuts FAB products with full Photoshop. Win-Win! What’s not to love! IMHO. Happy Holidays. These are absolutely gorgeous. I don’t know how much I’ll be able to use them, but I’m buying them anyway! Can this be used in Photoshop Elements, or do you need full Photoshop? Thank you so much for your comment and the good news is that as the designer has included JPG, EPS and PNG files, these should work for you in Photoshop Elements. As we do not work in Photoshop Elements ourselves, I am unable to fully confirm if the PSD files will be fully compatible for you unfortunately but rest assured we would be more than happy for you to purchase the pack, trial it out and see if it’s a good fit for you. Hopefully you do find it to be useful, however if you decide it’s not for you please do let me know within 30 days of your purchase and I will happily refund you in full :). I hope this helps ease your mind about purchasing the Chalk Extravaganza Pack, if you have any more questions then please do get in touch, we are always happy to help! This is a great Design Pack! Thank you, Jo and Design Cuts for the 50% discount! Wow! What a beautiful set! 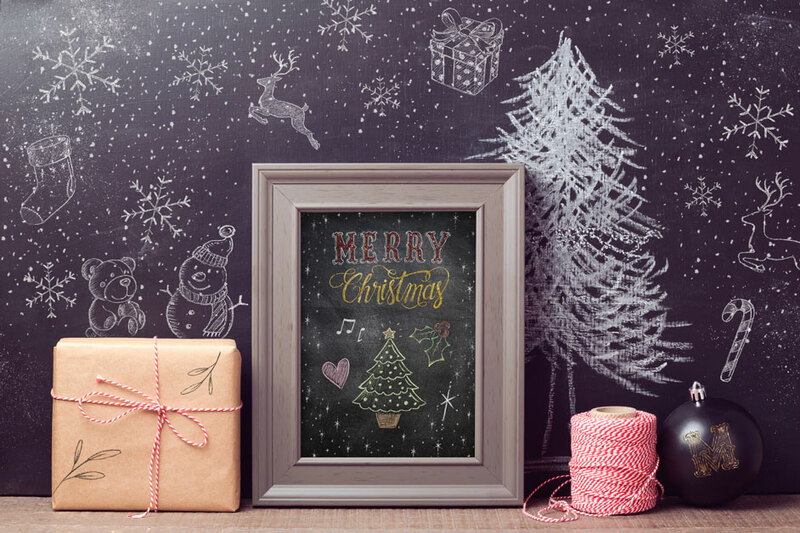 Could you please tell me if you can change the color of the chalk in Adobe Illustrator and/or in Photoshop Elements. Thanks so much and congratulations on your beautiful work. Thank you so much for reaching out to us and we’re so happy to hear that you find this pack a really beautiful set! The great news is that as this pack includes JPG, EPS and PNG files, these should work for you in Photoshop Elements. Unfortunately as we do not work with Elements ourselves I am unable to fully confirm whether the PSD files will completely work for you, but Adobe do say that Elements should be able to open and work with PSD files without difficulty. I would be more than happy for you to purchase the pack to trial it out and see if it’s a good fit for you. Hopefully you do find that this one is useful for your projects, however if you decide it’s not for you please do let me know within 30 days of your purchase and I will happily refund you in full :).